Spotlights show the rain as it falls on Launch Pad 39A as space shuttle Discovery awaits liftoff during an early morning launch attempt on Aug. 25, 2009. Thisstory was updated at 7:00 p.m. EDT. CAPECANAVERAL, Fla. - A broken valve on the space shuttle Discovery forced NASA tocall off the spacecraft?s second launch attempt in a row late Tuesday asengineers troubleshoot the glitch. Discoverywas slated to blast off at 1:10 a.m. EDT (0510 GMT) Wednesday morning, but abroken fill-and-drain valve associated with the shuttle?s liquid hydrogenpropellant system foiled theattempted launch. ?Thisparticular valve did not open and close the way it was supposed to,? said NASAlaunch commentator Allard Beutel. NASAengineers are discussing the malfunction, which cropped up during Discovery?sfueling operations at 5:52 p.m. EDT (2122 GMT), just under seven hoursbefore launch time. Stormy weather delayed Discovery?s firstlaunch attempt earlier today. 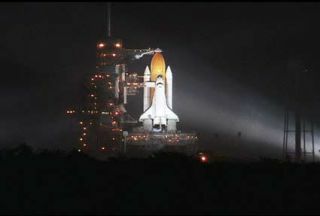 NASA hasuntil Aug. 30 to launch the shuttle before standing down due to restrictions onthe launch range it shares with the nearby Cape Canaveral Air Force Station.Engineers are discussing how to best solve the valve malfunction and whenDiscovery may be ready to launch again. ?At thisparticular time, we don?t know when the next launch attempt might be,? Beutelsaid. NASA wantsto launch Discovery by the end of August to avoid a traffic conflict with anunmanned Japanese cargo ship also due at the space station this month. If themission is unable to launch by then, NASA can try again on Oct. 17. NASA spaceshuttles use 526,000 gallons of super-cold liquid hydrogen and liquid oxygenpropellant to feed their main engines during the 8 1/2-minute launch intospace. The orbiters have two 8-inch propellant fill-and-drain valves, one each forhydrogen and oxygen, in their aft compartments that are required to workperfectly in order to lift off. ?When [launchcontrollers] commanded it to be closed, they didn?t get an indication that itwas closed,? NASA spokesperson Candrea Thomas said of Discovery?s hydrogenvalve. ?So that?s the issue.? The valve iscurrently open, which allows the shuttle?s fuel tank to be drained, but must beclosed during launch, she added. The aftcompartment that houses Discovery?s broken valve is accessible to shuttletechnicians at the launch pad. But NASA must first drain the shuttle?s 15-storyfuel tank and safeguard Discovery?s explosive bolts and other pyrotechnicsystems before engineers can study the faulty valve, Thomas said. Commandedby veteran shuttle flyer Rick Sturckow, Discovery?s STS-128 mission is slatedto fly to the International Space Station to deliver nearly 8 tons of cargo,including new science gear and a treadmill named after comedianStephen Colbert. The 13-day mission was also planned to ferry astronautNicole Stott to the station to replace NASA astronaut Tim Kopra, who has livedaboard the orbiting lab since mid-July. Set tolaunch aboard Discovery with Sturckow and Stott were STS-128 mission specialistsChris Patrick Forrester, Jose Hernandez, Danny Olivas and Swedish astronautChrister Fuglesang. Fuglesang represents the European Space Agency, while therest are NASA astronauts. Three spacewalks are plannedfor the mission. NASA plansto hold a press conference late Tuesday to discuss today?s launch scrub andforward plans for Discovery?s mission.